If you’re a fan of the eponymous HBO musical comedy series that chronicles the mishaps, romantic and otherwise, of brothers in charms Jemaine Clement and Bret McKenzie, then you’ve heard all of these songs on the show’s second season. Perhaps you’ve even downloaded all 10 of the 13 tracks that were made available on iTunes. Those who waited for the collected kit and kaboodle are rewarded with three tracks that were featured in the show but weren’t released. 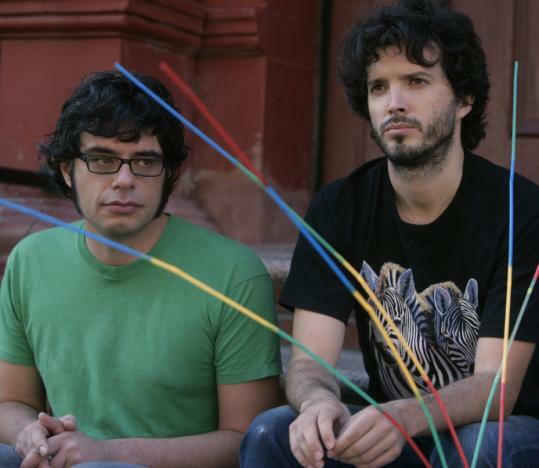 The Emmy-nominated, Grammy-winning pair comically bill themselves as “formerly New Zealand’s fourth most popular guitar-based digi-bongo a cappella-rap-funk-comedy folk duo’’ but the Conchords really are that diverse in scope and compose with both love and satire in their hearts. From the weepy, faux-gangsta rap of “Hurt Feelings’’ - in which Clement laments the lack of compliments for his profiteroles - to the absurdist electronic ditty “Fashion Is Danger’’ to the reggae bouncer “You Don’t Have to Be a Prostitute’’ the duo sticks the landings. The album’s masterpiece may be its most deceptively simple tune. “Carol Brown’’ details the litany of ladies who have kicked Clement to the curb, but the fun mash-up of lo-fi alterna-folk Casio tones and swell Burt Bacharach backing vocals makes the tale of woe go down easily, and hilariously.